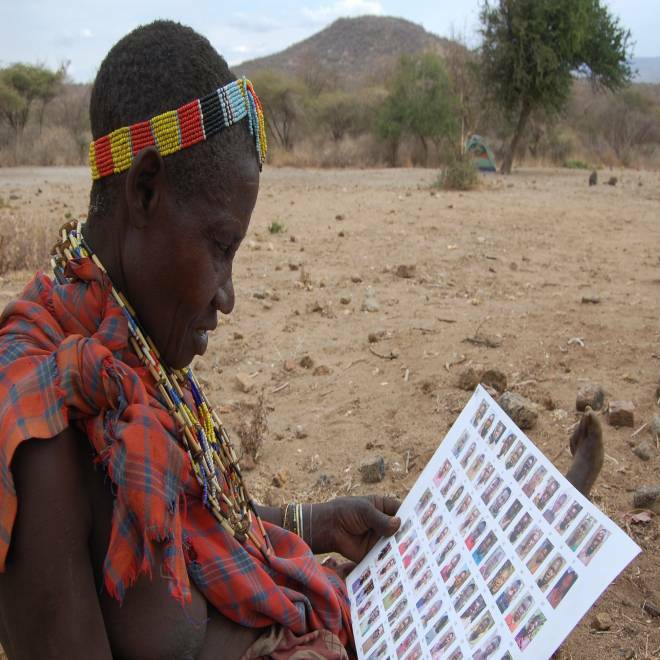 A woman from Tanzania's Hadzabe tribe studies a social-networking chart. Hunter-gatherers exhibit many of the "friending" habits familiar to Facebook users, suggesting that the patterns for social networking were set early in the history of our species. At least that's the conclusion from a group of researchers who mapped the connections among members of the Hadza ethnic group in Tanzania's Lake Eyasi region. The results were published in this week's issue of the journal Nature. "The astonishing thing is that ancient human social networks so very much resemble what we see today," senior author Nicholas Christakis, a sociologist at Harvard Medical School, said in a university news release. Researchers from Harvard, the University of California at San Diego and Cambridge University worked together to document the Hadza's social networks. "From the time we were around campfires and had words floating through the air, to today when we have digital packets floating through the ether, we've made networks of basically the same kind," Christakis said. Another co-author of the study, UCSD's James Fowler, said the results suggest that the structure of today's social networks go back to a time before the invention of agriculture, tens of thousands of years ago. For decades, social scientists have puzzled over the origins of cooperative and altruistic behavior that benefits the group at the expense of the individual. That seems to run counter to a basic "tooth and claw" view of evolution, in which each individual fights for survival, or at least the survival of its gene pool. One of the leading hypotheses is that a system to reward cooperation and punish non-cooperators ("free riders") grew out of a sense of genetic kinship between related individuals. But how far back did such a system arise? Harvard Medical School researcher Coren Apicella discusses the Hadza social network. To investigate that question, researchers spent two months interviewing more than 200 adult members of the Hadza group who still live in a traditional, nomadic, pre-agricultural setting. To chart the social connections, the researchers asked the adults to identify the individuals they'd like to live with in their next encampment. They also looked into gift-giving connections by giving their experimental subjects three straws of honey — one of the Hadza's best-loved treats — and asking them to assign them secretly to anyone else in the camp. That exercise produced a complex web of 1,263 "campmate ties" and 426 "gift ties." Separately, the researchers gave the Hadza additional honey straws that they could either keep for themselves or donate for group distribution. That was used as a measure of cooperation vs. non-cooperation. When the researchers analyzed all the linkages, they found that cooperators tended to group themselves together into one set of social clusters, while non-cooperators were in separate clusters. Even when other factors were taken into account, such as connections between kin and geographical proximity, the cooperation vs. non-cooperation distinction was significant. That finding suggested that even in pre-agricultural societies, social networking strengthened the connections between people inclined toward different kinds of behavior. "If you can get cooperators to cluster together in social space, cooperation can evolve," said Coren Apicella, a postdoctoral researcher specializing in health-care policy at Harvard Medical School and the Nature paper's first author. "Social networks allow this to happen." The researchers said the dynamics of the Hadza social networks — including the kinds of ties that bind a group's most popular members and the reciprocal connections within the group — were indistinguishable from previously gathered data about social networks in modern communities. "We turned the data over lots of different ways," Fowler said in the news release. "We looked at over a dozen measures that social network analysts use to compare networks, and pretty much, the Hadza are like us." Beyond the Facebook angle, the rise of relationships between cooperative individuals has larger implications for the study of human evolution. "This suggests that social networks may have co-evolved with the widespread cooperation in humans that we observe today," the researchers wrote. Update for 2:15 p.m. ET: In a Nature commentary, University of British Columbia anthropologist Joseph Henrich said that the study provided a "glimpse into the social dynamics of one of the few remaining populations of nomadic hunter-gatherers" — and pointed up the parallels between modern-day social networking and the kind of society in which our distant ancestors lived. One of the more interesting findings was that non-cooperators preferred to associate with other non-cooperators, rather than with the givers in the Hadza group, Henrich told me. That could be because people tend to make those they associate with more similar to themselves — sort of like a curmudgeonly married couple. Or it could be because non-cooperative types avoid the cooperators in the first place — sort of like the high-school kids who shun the goody-goodies and form their own clique of bad boys and girls. Henrich said the cooperation vs. non-cooperation distinction was surprisingly strong. "In fact, the gift-network results indicate that this extends to friends of friends: if your friend's friend is highly cooperative, you are likely to cooperate more, too." He said the findings support the principle of homophily in social relations: "People tend to pick people like themselves." But does the cooperation connection apply to modern-day social networks as well? If you're a giving person, do you tend to friend other givers online? "We don't know," Henrich told me. That's a topic for further research. Update for 10:35 p.m. ET: In a follow-up phone interview, Fowler told me the results that he and his colleagues are reporting add a new twist to the old nature vs. nurture debate. People aren't shaped merely by genetics and their physical environment, he said. "Social networks were actually just as important as the other two," he said. There may even be a genetic component to the associations you make. Along with Christakis and UCSD's Christopher Dawes, Fowler conducted research suggesting that genetic factors affect social behaviors. Previous studies have also shown that social networking among hunter-gatherer societies like the Hadza are not governed strictly by kin-based relationships. "What's new here is that we've specifically tied this idea of cooperation to ties between non-kin," Fowler said. Fowler acknowledged that studying hunter-gatherer societies are not a foolproof way to trace the evolutionary roots of the behaviors we see in modern-day society, including Facebook friending and Twitter tweeting. "This isn't necessarily the be-all and end-all of determining what we were like hundreds of thousands of years ago," he said. But considering that scientists can't interview Stone Age social networkers, Fowler believes this is one of the best methods available to anthropologists. In addition to Apicella, Christakis and Fowler, authors of "Social Networks and Cooperation in Hunter-Gatherers" include Cambridge University's Frank Marlowe.